Stutzman, Indiana’s Third District House Representative, has forgotten his Constitutional underpinnings – or he has chosen to simply ignore them. As he whines about the TeaPublicans needing some measure of “respect”, he thoroughly trounces the Constitution which he so passionately supports – or so he says. The Congress – not the president – is responsible for establishing revenue sources and for appropriating and designating funds for the budget. The president sends a tentative budget to the House. The House sifts through it, makes changes, and then sends it to the Senate. The Senate marks it up as well, and the disagreements go to a conference committee where differences are resolved. When done, it is sent to the President for his approval or rejection. 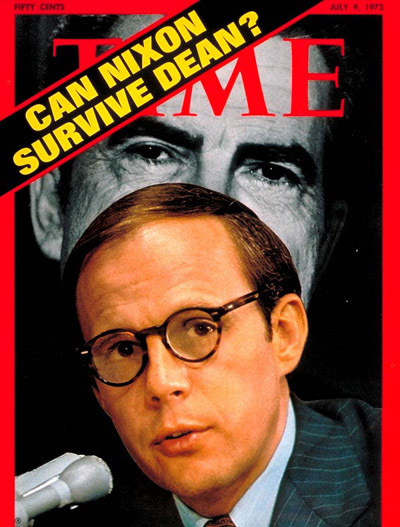 John Dean, former Nixon cohort in crime, has over the years come to pretty much despise Republicans. He writes as an analyst for Verdict, which is a component of Justia, and he writes some very good pieces. Given my dislike of anything Nixon and pretty much all things Republican nowadays, I almost ignored reading an excellent piece he wrote for Justia about the use of extortion by the Republicans to get their way when they cannot do so legitimately. The United States Constitution establishes a government which was intended to function 24/7, 365 days a year. No where in the Constitution can be found a provision for shutting down the government because some individuals are unhappy. Laws are passed, and they take effect. Provisions are in place to change that through the legitimate process established in the Constitution – not by some irresponsible process found in the minds of TeaPublicans. Stutzman took an Oath to uphold the Constitution and its laws and to faithfully discharge his duties, yet he conspired with other Republicans to violate that Oath by refusing to fund the government and to ignore his obligation to discharge his duties. Stutzman mouths the virtue of respect yet refuses to actually follow his own words. Stutzman is a Cruz clone, and, in voting to shut down the government, he has decided that his own idea of Constitutional interpretation is superior to the actual words and intent of the Founders. His foot-in-mouth moment that has now become a “shot heard ’round the world” demonstrates his idea of respect: he wants respect for himself but won’t give it for the very government created by the Constitution, which he swore to uphold. Our Third District Representative is pretty much a non-starter when it comes to helping our district and its residents. Since he took office in 2010, Stutzman has spent a great deal of time raising money to ensure his hold on a lengthy political career as a Washington insider – one of those hated creatures of the night hanging out in the halls of Congress. Mere weeks after his election, he brought a corporate lobbyist on as his Chief of Staff. And, in no area are his lackluster efforts more apparent than in the area of helping our veteran population. First, a little history. In 2004, then Secretary of Veterans Affairs, Anthony Principi, announced that the inpatient beds at the local VA hospital would be closed. That one announcement triggered a firestorm of opposition and a struggle lasting for years to rally support to save the inpatient beds. Our small group, Veterans for Better Health Care, participated in dozens of parades, wrote letters to the editor, handed out thousands of flyers, attended town hall meetings, and argued our case to anyone who would listen every chance we got. I was fortunate enough to be further included in two studies done by Booz Allen Hamilton, a Washington-based research company, addressing the future of the VA hospital, both as to outpatient care and inpatient care. The final recommendations included a spacious new 220,000 square-foot Community Based Outpatient Clinic (CBOC). The inpatient issue was still somewhat up in the air, but at least we had been told our new CBOC would add a much-needed component to the care our veterans deserved. Then, abruptly, in April 2011 we were told we had understood “incorrectly” and that, instead of a 220,000 square-foot, we would now get a 27,000 square-foot mental health and addictions clinic. When pushed on the issue, Representative Stutzman simply rolled over, put on a happy face, and called the decision a great advancement for the care of veterans in our area. While I agree we need a mental health and addictions facility for our veterans, Stutzman made no effort to find out what happened to the original plans. He simply accepted the new decision and twisted the situation to match his inability to make a difference. At the Republican Lincoln Day dinner in April 2011, Stutzman said “he was pushing for a new, 27,000 square foot expansion for a mental health annex.” Pushing? Pushing for something that we had already been told would be shoved down our throats? He should have been outraged that the fight that had gone on for years had been totally disregarded sending us back to square one and that the promised 220,000 square-foot clinic had been sliced by almost 90%. Dan Coats is a whiner. We pay our elected officials to complete a job which includes up to the day they leave office. But that seems to be too much for Coats to bear, and, instead, he would rather have seen our “lame-duck” officials sit back, take it easy, leave any number of important issues undecided, and head for the hills come January. Of course, Coats would rather have had he and his new Republican cronies take control of all those issues to decide in favor of their wealthy contributors. After all, the wealthiest of the wealthy could have counted on Coats and his buddies to extend the tax cuts permanently, ensuring continued gracious support from them come election time. He accused Democratic leaders of threatening members with an extended session to win votes on “unpopular” bills. Two-thirds of the public vigorously opposed extending the tax cuts to the top earners over $250,000. Was that the unpopular bill of which he spoke? Although disagreement cropped up within the Democratic party over the tax cut bill, the Democrats got some good bills passed. Just what did Coats decide he didn’t want done? Did he want the tax cuts to expire so that the issue could become a given with the wealthy winning tax cuts into eternity? And the rest of the taxpayers seeing an increase in their already dwindling take-home income? Did he want the thousands and thousands whose unemployment benefits were to expire to face weeks with the Republicans dithering over whether the benefits should continue or not? Coats carpetbagged his way into another senate term, and he is now acting like a spoiled child who didn’t get the toys he wanted for Christmas. He says he is part of a group that is being “sent to Washington to do things differently.” Well, nothing is stopping him from doing things differently when his term starts. But, for now, our congressional members earned their pay right up to the end of their terms. Nothing wrong with that. We paid them to do so, and they did. Coats isn’t a senator yet, but, heaven help us when he is, once again, in that position. Marlin Stutzman’s website states the following: “The most crucial issue facing Indiana today is creating jobs for Hoosier families.” Yet, earlier this year, before he was selected in caucus proceedings to run for Mark Souder’s empty seat, Stutzman took a different stance. And, while Stutzman was adamant he would not “bail out” General Motors, he was – hmm – taking farm subsidies – a form of quasi bail out for his farming operation and a manipulation – to his benefit – of that free market in which he so heartily believes. But, Stutzman isn’t required to pay back the farm subsidies while GM is required to pay back the bail out loan. Bazinga! GM’s failure would have resulted in an estimated loss of over 10,000 jobs – both direct through the termination of workers and indirect through the loss to suppliers, retailers, etc. Even Representative Souder – for whom Stutzman worked for three years – had enough common sense to vote for the loan to GM understanding the devastating impact the closure of GM would have had on the Third District. If this is how Stutzman feels, why would Third District voters – especially business owners – want a representative with this attitude in Congress? His response to the bail out question was an extremely short-sighted and shallow answer to a critical issue which impacted the Third District and its representative – a position for which he is running and for which he is obviously not ready since he fails to understand how to balance his ideology with the good of Third District constituents. And where does Dr. Hayhurst stand on GM and its workers? Here is his statement in a recent Fort Wayne Reader article. Dr. Hayhurst understands this District and what it takes to protect our interests. Where Stutzman would have abandoned GM, Dr. Hayhurst would have remained steady in his support – now that is the kind of representative we need. Dan “I’m no Hoosier Anymore” Coats has decided that he will now be a Hoosier again for the sake of his own self-interest party. This will be an interesting primary on the Republican side of the ticket. If Republicans are going to stick to their oft-spouted values about the nastiness of lobbyists and Washington insiders, then Coats should not win the nomination in May. However, Republicans may want an additional senate seat so badly that they are more than willing to swallow their “values” and throw their support behind Coats despite his abandonment of Hoosiers for over a decade and his lobbying efforts and ultimate status as a Washington insider. The other candidates who have already filed and put time and effort into their campaigns should be outraged at Coats’ blatant opportunism and lack of consideration for fellow Republicans. Had the Supreme Court not made its ridiculous and lop-sided decision boosting corporate power to influence elections, Coats would have not even thought about running in the state he left so many years ago. Pretty coincidental that Coats jumped up and shouted “No, no, I really am a Hoosier” so quickly after the Supreme Court’s decision. Coats was underway in his plans to make North Carolina his “new” home. If Republicans keep to their lofty musings, then Coats will be sent packing to crawl right back into the North Carolina woodwork.